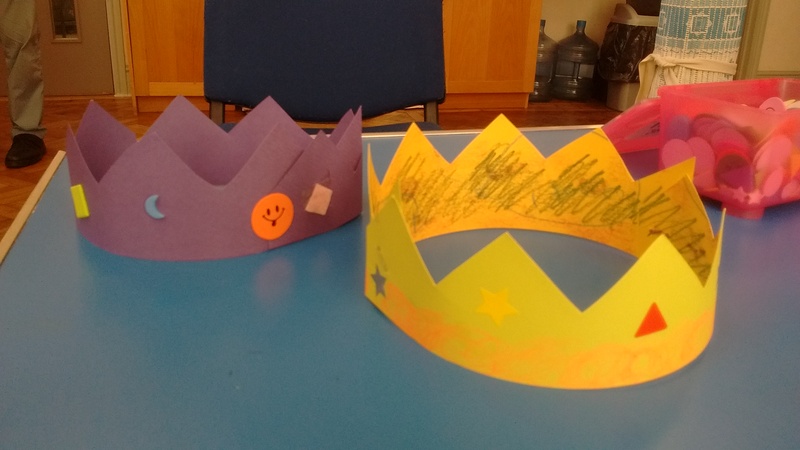 As it was the first week back after Christmas we read the story of the three kings and made crowns. For toddlers’ heads you can make a crown using half of a piece of A4 card (cut so that your piece is as long as possible). Cut a zigzag line down the middle of your piece, and you have two pieces you can tape or staple together to make a crown. The children will find it easier to decorate the crowns while they are flat, so just fasten the two pieces together in one place to start with. After the decoration is finished you can wrap the crown round the child’s head to measure where to put the other staple or piece of sellotape. If you are using staples, try to make sure they won’t scratch the child’s head – best to tape over them.